To access a bill’s information page, click on the measures bill number and title. This will open a new page that displays detailed information about the measure you selected, including a summary of the bill. 1) Bill Category (Impact Rating): a small colored box to the left of the bill number and title indicates the bill category from the color-coding system (e.g. not enough information, appropriations only, mild impact, moderate impact, high impact). For more information, read the “Impact Rating” tutorial here. 2) Bill Number: the number and code assigned by the Legislature as a unique identifier for each bill. The letters in the code reflect the chamber in which the measure was introduced (House or Senate) and the type of measure (e.g. bill, memorial). More information on the codes can be found in the Glossary section. 3) Bill Title: the name next to the bill number is the short title of the bill, which is the most commonly referred-to title. 4) Long Title: the long title is determined by the legislative staff when a bill is drafted, and follows a fairly strict protocol for inclusion of certain language, hence the length. For example, it describes whether a bill is enacting new laws or amending existing statue. 5) Legislative URL: the New Mexico Legislative Webpage (NMLegis.gov) for a measure. 6) Emergency Clause: unless a bill contains an emergency clause, it will go into effect on July 1st following the legislative session in which it was enacted. In some instances, a bill will include an emergency clause which allows it to go into effect immediately after it is signed into law. For the bill to pass with an emergency clause, it must be approved by a super-majority (2/3rds) of both chambers of the Legislature. If it fails to secure a super-majority vote in either chamber, the bill will still pass, but the emergency clause will be removed. 7) Germane: legislative sessions in New Mexico alternate between 60 days (‘long’) and 30 days (‘short’). During 30-day sessions, the only bills that can be considered by the Legislature are those that have direct budget implications or measures that the Governor specifically directs the Legislature to consider (referred to as “the Governor’s call”). This restriction does not apply to resolutions and memorials, which may be considered by the Legislature in any session. 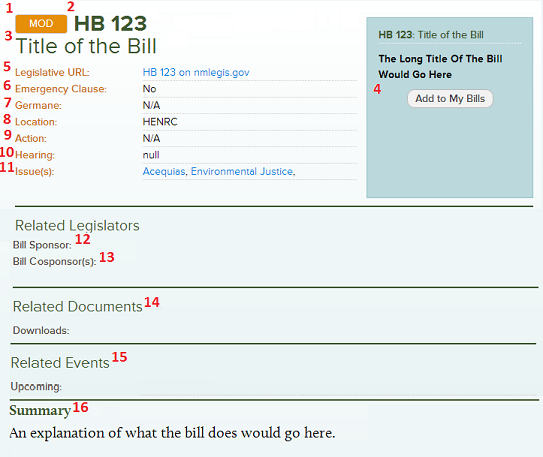 8) Location: the code in the “Location” field refers to where in the legislative process a bill is currently. For example, if the bill is in a particular committee awaiting a hearing, that committee’s code will be noted under Location. If it’s on the calendar or floor of either the House or Senate awaiting a vote, this will be reflected in the Location field. 9) Action: this field includes a synopsis of all the actions the Legislature has taken on the bill since it was introduced (the most recent action at the end of the list). Although it looks very complicated to decipher, it really isn’t — all of the information on the various codes and abbreviations can be found in the Glossary. Once you’ve worked through the process a few times, it will become very easy for you to follow all of the actions on measures in your bill manager. Note: the first entries for a bill indicate the committees to which it was assigned; the very last entry is its current location or most recent action. 10) Hearing: indicates whether the measure is going to be heard in an upcoming hearing. 11) Issue(s): this field lists all of the environmental issue areas that the bill affects. This is a subjective assessment. 12) Sponsor: this field lists the principal legislative sponsor of a measure. 13) Co-Sponsor(s): although there can only be one principal sponsor of a legislative measure, other legislators can ‘sign on’ to the legislation prior to introduction. Please note that a blank “Co-Sponsor” field does mean that there are not co-sponsors for a measure. 14) Related Documents: here, you can download documents directly related to the bill. You can also view the same documents on the NMLegis.gov website. 15) Related Events: this field lists any related events (upcoming hearing dates and times, for example) that are associated with the measure. 16) Summary: here, you will find a brief summary of what the bill does.